CENTRAL COAST -- California is a very large state that is divided into 10 not so equal sections. The Central Coast Section seems to fit right in the middle as it is neither a large nor small section. It was established in 1965 as many of the schools now in CCS used to be part of the North Coast Section (that mid-season report will be posted tomorrow). During the next few weeks, most teams will be racing their league rivals while keeping an eye on the fast-approaching league championship meets along with the most important meet for most section teams, the Central Coast Section Championship meet at the historic Crystal Springs course. Last season, there was a clear number 1 individual and that was Bellarmine senior, Meika Beaudoin-Rousseau. He roared through most of the season as the dominant runner in the section and perhaps the state only to be slowed down by an injury before the California state meet. Beaudoin-Rousseau is now a Stanford freshman which means that title of the best individual in the section is up for grabs. This year, there are several contenders for top individuals in this section. At this point, the most consistent runner has been St. Francis senior, Colton Colonna. He was part of the strong Lancer team from last year and this year he has been their unquestioned lead runner. His main competition has come from league rival and Bellarmine sophomore, Colin Peattie. He missed his 9th-grade cross country season due to an injury but more than made up for it during the spring track season with a section record 4:16.83 for the 1600m. He has continued his impressive running this fall with several top finishes as well as a 7th place finish at the Stanford Invitational, only 3 seconds behind Colonna. Los Altos senior Owen MacKenzie was the CCS champion in the 3200m last spring with a best of 9:07.95. He has had two top-three finishes this fall at the Lowell and Earlybird Invitationals but may be dealing with an injury at this point. Palo Alto senior Henry Saul has been one of the top individuals in the section but he is currently nursing an injury. 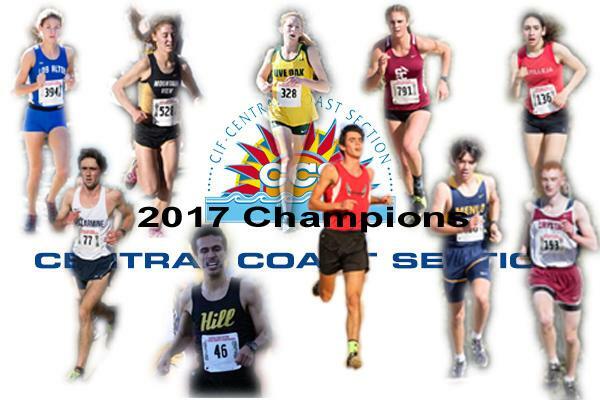 With Peattie being the top individual in Division I and Colonna in Division II, the rest of the divisions are led by Rico Garcia of Greenfield in III, Chris Anderson of San Lorenzo Valley and Christopher Plascencia of Marina in IV and Caleb Dittmar of Nueva in V.
The top individual girls in the section seem to all be in one division and that is Division IV. This is not unusual as some of the top individuals in CCS history have competed in the same division like Anna Maxwell of San Lorenzo Valley, Cate Ratliff of Santa Cruz and Vanessa Fraser of Scotts Valley. This year, the lead runner appears to be Santa Cruz senior Lila Roake. She may not have the same stellar lineup that Santa Cruz has enjoyed the past few years but this may be her best season to date. At the Stanford Invitational, Roake won the Division IV race in 18:23.40. She was followed by Harker sophomore Anna Weirich who ran 18:27.70 and Scotts Valley senior Jessica Kain in 18:35.60. I did mention that Division IV is loaded and there are definitely more runners in the mix and they all compete in the WBAL. Menlo juniors Charlotte Tomkinson and Kyra Pretre have been raced near the front of all their races this fall. The King's Academy junior Anna Mokkapati won the 3200m at the CCS meet last year and will be one of the top contenders in XC as well. The rest of the divisions are currently led by Kamie Gescuk of Carlmont in Division I, Gianna Mendoza of Presentation in Division II, Audrey Reed of Live Oak in Division III and Tevah Gevelber of Castilleja in Division V.
The St. Francis boys enjoyed a historical year as they swept the WCAL, CCS and state meet races. They finished up their amazing 2017 season with a 8th place finish at NXN. With most of their top runners back this year, the Lancers have been impressive with a few hiccups. Keeping them honest will be a young Bellarmine team that includes four sophomores and three seniors in their varsity lineup. They are led by sophomore ace Colin Peattie who will need to break up the St. Francis front pack in order the Bells to have any hope of dethroning the defending champions. The next best team appears to be Scotts Valley out of Division IV. They easily won the Stanford Invitational Division IV race ahead of fellow CCS competitors, King City, Sacred Heart Prep and San Lorenzo Valley. Another team that could contend is Los Altos. They will need the return of a healthy Owen MacKenzie if they are to give Bellarmine a race at the CCS meet. Willow Glen has been a top competitor in Division II and will aim for a state meet spot once again this year. Sacred Heart Cathedral appears to be the best team in Division III and if those boys win a section title, watch out Coach Andy Chan! In Division V, Nueva and Crystal Springs Uplands will once again battle for the team title. St. Francis could make it a clean sweep of the top teams in the section as they appear to also have the best girls' team in the section. They will need the return of a healthy Issy Cairns to really bolster their lineup but for now, they are still the best squad in the section. Over the past few weeks, Carlmont has emerged as the best Division I team following an impressive outing at the Clovis Invitational. They will be favored to win another title this year and will need to hold off another historically strong section program, Los Gatos. The leading contenders for St. Francis in Division II will be Aragon, Leland, Lynbrook, Presentation, Willow Glen and a suddenly potent Woodside group led by veteran coach, Al Hernandez. In Division III, it's hard to pick against Aptos as they chase their 7th straight section title. They are off the radar at the moment but if there is one coach that could somehow pull off another victory, it's Dan Gruber. The Menlo girls are the best team in Division IV and will be chasing their first section title in Cross Country. Their school trophy case is quite full from other sports but this year, the Cross Country team will be aiming for their own trophy. In Division V, the best team at this point appears to be Castilleja. They have been chasing Nueva for the past two years and this year, it appears that they will finally reclaim another section title. After Nueva, the race for the last state meet spot appears to be between Notre Dame Salinas, Woodside Priory and Crystal Springs Uplands.